1. Plant your tomato seedling deeply (up to where the leaves start), and at the same time, drive a bamboo stake into the ground right next to it, 8 to 12 inches deep in the ground. If you’ve already got crazy tomato growth, just put the bamboo stake in place right next to the plant. 2. Tie the stem to the bamboo pole with twine. Tie it all the way to the top of the main vine. 4. Keep adding more ties as the tomatoes grow. 5. Add a crossbar of bamboo between two tomato stakes to strengthen the staking, and allow the tomatoes to spread out. 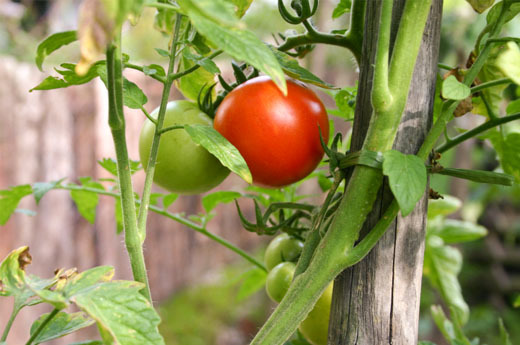 There are two types of tomato plants, determinate and indeterminate. Determinate will only grow to a certain size and bear their tomatoes all at once. Indeterminate will keep on growing and keep on bearing. If you have indeterminate tomatoes, you can keep on adding taller and taller stakes, and keep on tying! Bamboo and twine are both biodegradable and compostable products. So when you are done staking, you have delicious tomatoes and leave nothing behind except a full belly. Interesting, but guess what, I do these things already. The only thing I don’t do(yet) is the cross bar. I have 5 different tomato plants that I am growing in large deep pots on the deck. They are doing well despite the late start that I got planting them. It is crucial to remove the suckers, I found that out years ago, it takes the energy away from the main stem. So, you Must do that to get large tomatoes. When I start to plant in the ground, I will use the bamboo cross. I am using bamboo stakes already, and put them in while the plant is young. I let the plants grow between 4 & 6 feet, then use velcro ties and reuse them every year until I can’t use them anymore. This is not exactly green, but it beats buying twine every year. It is important to remove those suckers, but did you know that you can actually plant them and get even more tomatoes?! Really. Just plant the suckers you’ve removed ‘up to their necks’ and keep them well-watered, at least until you see signs of new growth. Presto, new tomato plants! I’ve always left the suckers on…I mostly plant smaller tomatoes that mature more quickly since frost comes so early….I get tomatoes from all the branches. And on Sunday, by accident, I broke the top leader trying to redirect a wayward plant into the cage and if those suckers had been trimmed, I’d have a useless plant. My husband made me 4 foot high cages from wire that has holes large enough for me to put my hand through and pull out tomatoes…they’ve lasted for MANY years and often I don’t need to tie the plants at all. His system looks nice though, but I agree that those plants should have been staked much earlier. Well I have a question about suckers. Are there two kinds of suckers? I pick off the ones that form at each leaf, but sometimes after about two feet of growth, the tomato vine gets a branch in it, which does not look like a regular sucker. I have always left these because they looked like part of the vine. My tomatoes have always been fine, big and delicious, but I have wondered whether these things I think of as branches are really suckers and should be removed. They are in the same place as suckers, but look more like part of the vine. Thoughts? James, I do exactly the same as you — only prune the suckers that grow next to the leaves. I keep the aditional branch growth. I’m not positive this is perfect, but it works. I do the same as James and Pat. I have one of those plants now, and was trying to figure out if it was a sucker, or just an offshoot of the main stem. I left it because it just look too uniform to be a sucker. We like to use metal re-bars for staking. They have some advantages: no splinters, and they’ll be usable for a long time (great-great-grandchildren? ), plus their ridged texture means the twine stays where it’s tied. Our area of Ontario is in a drought, we haven’t had any rain for weeks. Our grass is crispy and brown. Some of our ‘drought-tolerant’ plants are string to pingle and pine, and I worry that they won’t make it. Should I let them die, or is it worth it to try to save them for next year? I hope this isn’t going to be the permanent weather pattern, but what if it is? I sucker and stake as well, but I tie using a “figure 8” with the pole in one loop and the tomato stem in the other loop to allow for a little movement in case of strong winds. i thought you aren’t supposed to take the suckers off one of them because it’ll actually reduce your yield? now of course i forget which one. yay, pregnancy brain! i’m a big fan of cattle panel for tomatoes and anything that vines. used it for the first time this year and it’s SO Easy and strong! If you want bigger (but fewer) tomatos pinch the suckers, but if you want aLOT of smaller tomatoes, don’t pinch the suckers. The size does not matter, it is the taste that matters! As long as I can cover a pimento cheese samdwich with freshly picked vine ripened tomatos, that is all I need. I have grown many vegetables but the tomato plant has never fared well for me. Maybe it is all in the staking, lol. Don’t forget to put a little bonemeal at the bottom of the hole before you plant tomatoes.